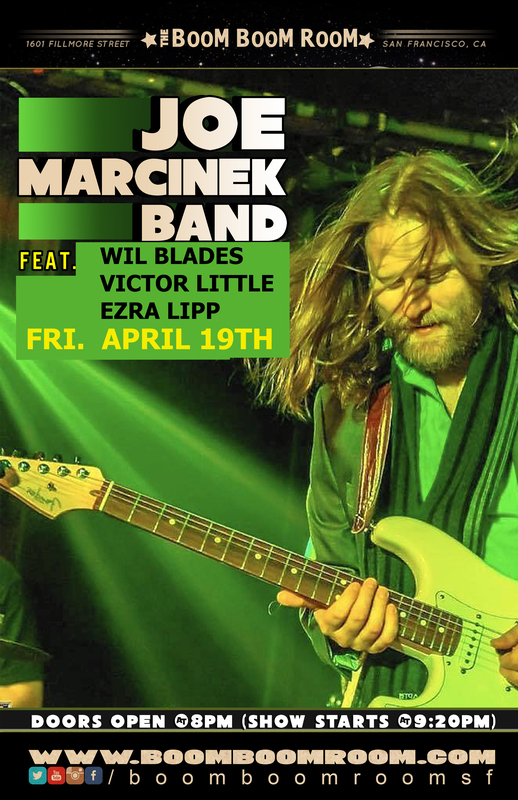 Joe Marcinek Band is joining with Wil Blades of Groundation, Victor Little of Robert Walter’s 20th Congress and Ezra Lipp of ALO for what promises to be a jam filled funky good time. Join us at the Boom Boom Room in San Francisco Friday, April 19th. An all star funk show! is an ever evolving mixture of originalcompositions and incredible musicians. Each show has a slightly differentlineup and interpretation. The music is a blend of jazz and funk with acerebral emphasis on groove and improvisation. The group has featured many prominent guests including Bernie Worrell (P-Funk,Talking Heads), Kris Myers (Umphrey’s McGee), Tony Hall (Dumpstaphunk, DaveMathews & Friends), Shaun Martin (Snarky Puppy, Kirk Franklin), AllenAucoin (the Disco Biscuits), Marty Sammon (Buddy Guy), Jason Hann (StringCheese Incident / EOTO), Erik “Jesus” Coomes (Lettuce), Jennifer Hartswickand Natalie Cressman (Trey Anastasio Band), Mike Greenfield (Lotus), Borham Lee(Break Science), Steve Molitz (Phil Lesh & Friends / Particle) Joey Porter(The Motet / Juno What), Fareed Haque, Scott Metzger, Nate Werth (Snarky Puppy)Garrett Sayers (The Motet) Allie Kral (Yonder Mountain String Band), Freekbass,Vinnie Amico and Jim Loughlin (moe.) and more! No less a jazz organ authority than the legendary Dr. Lonnie Smith has called Wil Blades “the future,” anointing him the heir apparent to “carry on the legend [and] the legacy of the organ, of the B-3.” Over the past fifteen years, Blades has grown to be one of the most in-demand organ players on the Bay Area scene. In addition to leading his own trio, he works regularly in duo situations with drummers Billy Martin (Medeski Martin and Wood) and Scott Amendola (Nels Cline Singers); and in trios led by guitarist Will Bernard and drummer Stanton Moore. He’s performed and recorded with a host of jazz and blues greats including Melvin Sparks, Idris Muhammad, Joe Louis Walker, Don Braden, Donald Harrison, Nicholas Payton, Karl Denson, Charlie Hunter, Jason Marsalis, Herlin Riley, and many others. VICTOR LITTLE is a true Master of the Groove ! His genius of innovation and technique, diversity of styles, genre-blending and bending into exceptional and electrifying new music, has put a hot spotlight on Victor Little across the globe. His talent has been described as “the most ‘under-the-radar’ musician ‘greats’ of our time” – Until now. Victor Little is on international music radar. Highly regarded worldwide by so many peers, musicians, producers, music listeners “in the know” and a huge and ever growing fanbase, Victor Little is a big hit! EZRA LIPP is a happening. Ezra Lipp is an innovative, Bay Area based drummer, composer and educator, who regularly performs with a slew of all star musicians, works as an in demand session musician, leads his own band Magic In The Other, and is the proud creator and host of a music podcast called The Ezra Lipp Hour (More or Less) . He has extensively toured the US and Europe and has worked with many amazing bands and artists representing diverse musical genres including Phil Lesh of the Grateful Dead, ALO, Melvin Seals and JGB, counter-cultural Iranian superstar Mohsen Namjoo, national folk-soul treasure Sean Hayes and many, many more [see below for a more complete list]. Ezra is a lifelong student of music and earned a bachelor’s degree in Music Performance and Jazz studies from the University of Vermont in 2005. He has also studied music and percussion from around the globe both in the US and abroad (including West African, North Indian, Afro-Cuban, and more). As a teacher he brings his depth and breadth of rhythmic knowledge and years of professional experience to help others along on a path to find their own creative musical voice and expression. Ezra’s imaginative approach, accomplished musicianship and refined sensibilities distinguish him as a truly creative contemporary musician and drum artist.